I described my Digital Leadership initiative in my last post and how students have signed on to participate. I managed to secure some time in our Resource Centre to supplement the lunchtime sessions so that students could work towards their badges. We have started with the twin options of MinecraftEDU and Sphero Robotics, but potentially down the track, the program could expand to Digital Leadership in iPads, BeeBots or other technology connected possibilities. We've had a Minecraft server for a few years now and I've blogged about some of the ways it has been used at our school after the research our school has done in the past. But the Spheros are brand new to me and the students. So in the last three weeks since I took delivery of the 15 little robotic balls, I have held two afternoons and four lunchtime sessions with the sole intent of letting the Leaders loose to work things out for themselves. It has been fascinating to watch. We have a few accessories to use with the Spheros - rubberised covers, small plastic chariots that have a Lego like connection section and Terrain packs with ramps, poles and connectors to create a stunt park or obstacle course. I nabbed a building's travel case of ten iPads and downloaded eight of the most useful Sphero apps, and supplemented them with my own staff iPad and a couple of spare Nexus 7 tablets not currently being used for anything else. The first challenge was getting the Spheros to connect and communicate with a device. 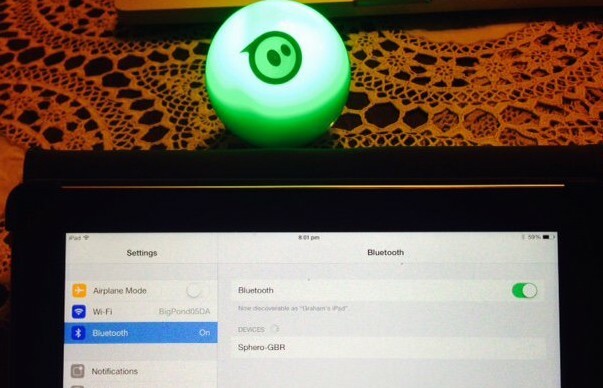 The connection is made via Bluetooth and every Sphero flashes its own tri-colour sequence when woken. My eBay special at home here has a sequence of Green, Blue, Red so it appears in the BlueTooth settings as Sphero-GBR. But you can imagine the mayhem when a whole bunch of stuents double tap their Spheros to wake them, forget to see what sequence is flashing and are confronted by a list of four to seven visible devices that are offering connection! 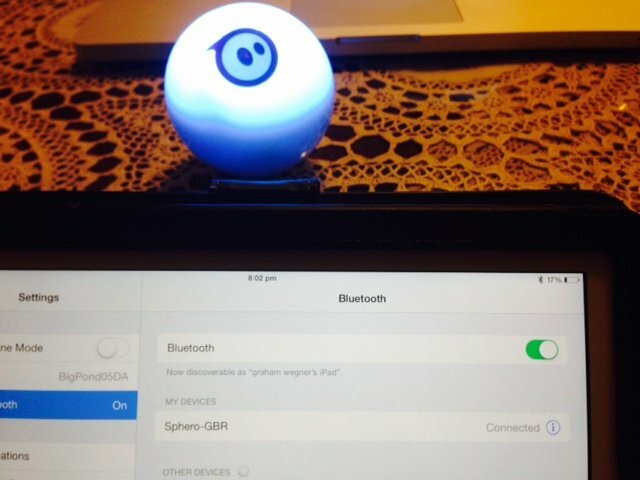 We started to see that often the Sphero the Leader wanted to use would not respond, or would suddenly start showing its blue aiming light but be under the control of someone else in the room who did not really know what their app was doing but they could tell they were connected to something! Once the connection issues were sorted, students had no problems getting the Spheros moving around the area using the Drive app - a simple set of controls allowing direction and speed as well as the ability to change LED colours and a limited number of "tricks" (zigzag, figure 8, square, circle, lightning). They tried out the nubby covers, zoomed around in the chariots, even allowing me to insert my iPhone into one of them and filming a Sphero Chariot POV of the Resource Centre surrounds. Eventually, a couple of the students asked to use the Terrain Pack gear and starting setting up jumps and obstacle challenges to drive the Spheros over and through. One of the badges I had designated was a Rally Driver's badge and we had some discussion about what this would entail. I talked about being able to successfully negotiate a prescribed route but that they could set up their own challenge. A number decided that getting over the long ramp as pictured left would be testament to their skill but it turned out not to be as easy as they first imagined! The Sphero's smooth surface spun and skidded on the way up so some Leaders switched to a cover to get some much needed traction. Eventually there was a lot of excitement as Spheros veered off track at the last second, as successful attempts went unwitnessed and unverified. A lot of play and a lot of learning was going on in all sessions, and the cooperative learning I envisaged was starting to unfold. A couple of more adventurous students decided to try out some of the other apps. One leader tried out the Sphero app which turns the use of the ball into a gaming experience with levels, points and rewards. This is quite a good way to get students thinking creatively about the Sphero and not just see it as a toy to drive around. The tricks that can be unlocked in the Core Exchange show that colour and movement sequences can be humorous and artistic, and can lead to the use of the MacroLab app where the programming aspect of Spheros can be utilised. Only a a small number of students have felt confident enough to have a go in this app but the pride in creating and programming a simple Macro could be clearly seen in the face of the two Leaders who just had to show me what they had coded. These leaders clearly need more time to grow their expertise and I am learning a lot just simply through observation and trying to solve their problems as they arise. Some students are even keen to help me pack everything up at the end of a session, ensuring that all Spheros are powered down and "asleep", everything in its correct box and easy to access for the next time. I want this group of about twenty students to be able to assist me when I start using these robotic balls with middle primary classes. One test lesson with a class in my building taught me that one teacher on his or her own will struggle to get first timers up and going without headaches galore. Having some expert Leaders on hand to help with connection, modelling appropriate care and encouragement will be of benefit to all parties. The teacher will appreciate the support, the students in the class will get a better lesson and the leaders will have helped others in their learning and put their particular skills to great use. Posted in Leadership, Mobile Technology, Programming on April 13, 2015 by Graham.